Franklin has an historical treasure in its preserved 1837 schoolhouse. In 1837, the one-room 18-foot square school was built on what is now known as Old Franklin School Road to replace a small log school that had been erected in 1826 and burned to the ground in 1836. Because it sat under large maple trees, it was unofficially called Maple Grove School. In 1871, it was replaced by a more modern building 200 feet away at what is now 131 Old Franklin School Road and used until 1936. That building still stands, but as a private home. Sometime after 1871, the original 1837 structure was moved a mile to what is now 103 Locust Grove Road where it became a barn, then a garage, and then a storage shed. In 1977, the structure was donated by Ronald and Brenda Sewell to Franklin’s Board of Education (BOE) and moved to its present location on the 1936 Franklin Township School (FTS) grounds and restored. Led by their social studies teacher, Nicholas Matlaga, FTS students sold U.S. bicentennial maps and raised $500 to help restore the building. The County Cultural & Heritage Commission added a $600 grant for a new roof. 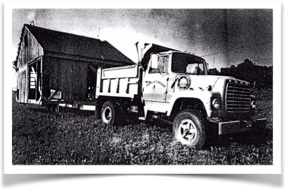 August Knispel, who was Mayor at the time, offered the Township Road Department’s services to move the building and build a foundation for it. In 1987, when the building was 150 years old, FTS students, led by the sixth, seventh and eighth graders, celebrated its anniversary with an ice cream social, pony rides and games. 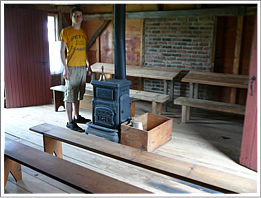 They rounded up benches and a wood stove for the classroom and gave tours of the building. In 1990, on February 2, the schoolhouse was listed on the State Register of Historic Places and on August 24, on the National Register. The BOE rejected a request from The Holcomb-Jimison Farmstead Museum in Lambertville to relocate the building there. In 1991, the FTS-Parent Teachers Association (PTA) spent $5,200 restoring the building. 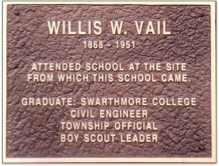 In 1995, in celebration of the 150th anniversary of Franklin Township, the PTA placed a bronze plaque on the 1837 Schoolhouse honoring Willis W. Vail for his many contributions to the school and years of service on the BOE. In 2009 when the building was 172 years old, it got a new foundation to meet code, exterior repairs, and new exterior paint. 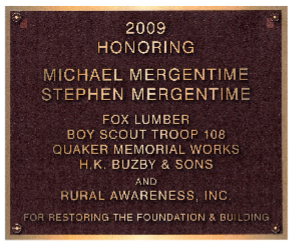 The foundation was built through the generous gift of Michael and Stephen Mergentime, FTS graduates and owners of Merco, Inc. in Flemington. Rural Awareness paid an exterminator to treat the building against bats, ants, termites and powder post beetles. James Foran led Boy Scout Troop 108 in Franklin in making several repairs on the building and painting it. Other local businesses provided materials. (See 2009 plaque below). A ceremony honoring their service was delayed because of major renovations to the large 1936 main school building. In 2015, Graham Boreland completed building 1837-style desks and benches and paneling the interior with 100-year-old hemlock salvaged from an old barn as his Eagle Scout project. The annual Rural Awareness essay competition asked FTS third, fourth and fifth grade students to write to the students in 2037 telling them what is special about the school in 2015 and what changes they expect will occur over the next 22 years. The essays are sealed in a time capsule to be opened in 2037 when the one-room schoolhouse is 200 years old. Fifth grader Elias Thompson, named Grand Champion in the competition, was given a key to the capsule. Another key is displayed in the trophy case in the school entryway where the capsule is stored, in case Elias is unable to attend the 200th anniversary celebration. In 2015 and 2016, Franklin Township School welcomed Hunterdon County Historian Stephanie Stevens to the old schoolhouse, where, in authentic 1800’s school-teacher garb, she taught a half-hour class for students in each grade. Studies included orthography (spelling), ciphering (arithmetic), recitation of the U.S. Presidents through 1837 while “toeing the line”, and practicing old-fashioned methods for penmanship. In 2016, Rural Awareness hosted two open houses at the old schoolhouse so members of the community could see the interior, read new descriptive signage, and celebrate its completion as a small museum. In 2017, Rural Awareness hosted an open house at the old schoolhouse on Memorial Day immediately following the Quakertown Fire Company’s services in front of Franklin Township School. In 1837 when the one-room school was built, students attended school every day but Sunday and holidays. Generally there were two terms of schooling, the summer term from May until August and the winter term from November through April. All children were available to help on the farm in September and October. Older boys who were needed in the fields during the growing and harvesting seasons would attend school only during the winter. After 1900, nine-month school terms were held from September to May. Classes were held from 9am to 4pm with an hour off for lunch and two 15-minute recesses, at 10:30 am and 2:30 pm. Students walked to school and back home, some up to three miles. There were no school buses and no snow days. They learned the 3Rs: ‘reading, ‘riting, and ‘rithmetic’. All grades were in the same small building. Older students helped younger ones with their coats and lessons. They also were given responsibility for carrying drinking water from a nearby spring and for hauling in wood or coal to keep the stove going for winter warmth. For personal hygiene, there were outdoor facilities, known as outhouses, one for girls and one for boys. Over time, Franklin has had 22 school buildings. The earliest were made from logs. From 1850 to 1912, there was one stone, two-story structure called “The Academy”, which shared space with the Odd Fellows Lackatong Lodge. All the others were frame buildings. Five different buildings have stood on the site of the present school in Quakertown. The first consolidated school in Hunterdon County, it was built in 1936 for $84,000. When the new school was completed, one-room schools in Cherryville, Pittstown, Quakertown, Sidney and the one called Franklin School on Old Schoolhouse Road were closed and the buildings sold at auction. All became private residences except for Sidney, which was dismantled and the wood used to make a chicken coop. The Quakertown school building was relocated across from the Methodist Church on Croton Road.